Hadleigh is a pleasant, self-important little town. It is one of those places remote enough to be a microcosm of bigger towns - the factories, shops and housing estates all to scale. Its centrality in this part of Suffolk gave it the headquarters of Babergh District Council in 1974, despite the fact that the greater part of the population of the district lives in the Sudbury conurbation and the southern suburbs of Ipswich. Having said that, Hadleigh has expanded greatly in recent years, with characterless new estates now lining the bypass. But the heart of the town is still probably the loveliest of any in East Anglia. If Hadleigh is small, however, St Mary is not. This is one of the grand Suffolk churches, the only big one with a medieval spire; indeed, the only proper wood and lead spire in the county. 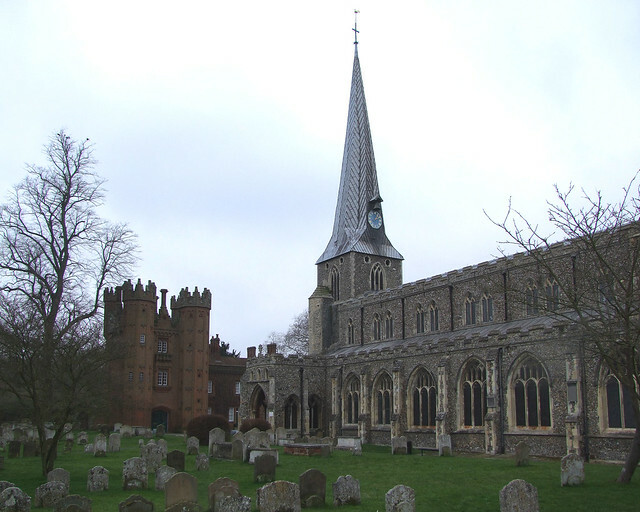 It was built in the 14th century, and the exterior bell, a 1280 clock bell doubling as a sanctus bell, is Suffolk's oldest. The aisles, clerestory and chancel head eastwards of it, for my money equalling Lavenham in their sense of the substantial. It is one of the longest churches in Suffolk. To the south west of the church stands the famous Hadleigh Deanery, more properly the gorgeous red brick Tudor gateway to the now demolished medieval Deanery. It was at this Deanery gateway in July 1833 that the meeting was held that gave birth to the Oxford Movement, which went on to change the face of Anglican churches forever. It is no exaggeration to say that the modern Church of England was born in this building. The Rector here, in one of those anachronisms so beloved of the CofE, is styled 'Dean of Bocking'. Bocking is a village in Essex, and the living is in the gift of the Archbishop of Canterbury, so Hadleigh Rectors are installed in Canterbury Cathedral. The south side of the graveyard is taken up by the former guild hall, and on the fourth side there is a scattering of excellent 18th and 19th century municipal and commercial buildings. With the possible exception of the Bury churches, it is the best setting of any urban church in Suffolk. Hadleigh was one of the great cloth towns, a centre for merchants rather than factories (most of the work was farmed out to self-employed weavers in nearby villages, quite literally a cottage industry). The wealth of those days rebuilt the church, particularly the fine 15th century clerestory and aisles.This is a big church, since it needed to contain the chantry altars of at least five medieval guilds. And it has always been an urban church, as you can tell from the way buildings on the north side cut into it. The east window was clearly always intended to be seen up the gap to the busy High Street. The magnificent south doorway retains its original 15th century doors. It is interesting to compare it with Cotton, barely 50 years older, but from a quite different generation of architecture. Gone are the delicate fleurons, the articulate details that speak of an internal sense of mystery. Here, we enter the realms of self-confident rationalism for the first time. You step into a space that is light and airy, but this is to do with the sheer volume of the interior as much as with any effect of the light. Trees close by on the north side gently wave shadows into the nave. It feels that the church is organically part of the town. Coming back in 2013 I remembered visit of ten years previously on a Holy Saturday. On that occasion, a large number of people were cleaning the church in preparation for the celebration of the Easter liturgy. The inside is so big, it is an ambitious task; but this church has been cleaned in a wider sense over the centuries, and, at first sight, it is hard to see this building as anything other than the rather polite CofE parish church it has become. But there is rather more to it than that. St Mary has a strong feeling of being the heart of a living faith community, but it is also because it is a bit more daring than most. The first hint of this is perhaps the surreal sight of a snooker table and a pool table in the north aisle. These are part of the Hadleigh Porch Project, an attempt to provide something to do for teenagers in the town who had been causing a nuisance in the churchyard and porch. The parish galvanised itself and attracted funding, and now the building is in regular use by young people for secular activities. The sense of ownership they feel gives them a sense of responsibility. And, coming here in Lent of 2013, I was struck by the Stations of the Cross lining the arcades, each created by a local youth group or organisation. They were radically different from anything I'd seen before, and I'm sure that Maggi Hambling's Christ, looking on from the north aisle, thoroughly approved. A giant Franciscan crucifix in the south aisle forms a modern setting for candles to be lit. There is a good 1980s window beside Maggi Hambling's painting, but the glass in the south aisle, mostly by Ward & Hughes, is less good. Of course, there is much here that is older and more traditional. In the south chancel chapel is the famous St Edmund bench end, attached to a modern bench. But is it really a representation of St Edmund? It appears to shows a wolf, with the Saint's head in its jaws. But if you look closely, the beast has cloven hooves, and is apparently wearing eucharistic vestments. There are squints through to the high altar from this chapel, so it was probably the site of a guild altar. Back in 2000, I had been pleased to learn that St Mary retained its high church tradition with the celebration of a monthly High Mass, which is still celebrated today. Church groups include a Walsingham Society. In the high sanctuary are not one, but two plaques to former Dean Hugh Rose, one commemorating his conference that led to the Oxford Movement, and the other the centenary of that movement, laid by the Archbishop of Canterbury in 1935. One of the plaques quotes Pusey's eulogy to Rose, that when hearts were failing, he bade us stir up the gift that was in us, and betake ourselves to our true mother. Another religious figure associated with Hadleigh is the puritan preacher Rowland Taylor, who was burned at the stake on nearby Aldham Common in the brief but unhappy reign of Mary I. One of the windows in the south aisle remembers him.